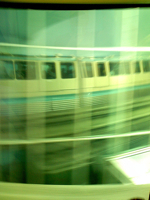 My wife and I live in Seattle, and we had put off taking our 3-year-old on the monorail until there had been a good unbroken period of good service. Today, with my brother-in-law in town, we took our older son, my brother-in-law, and our 3-month-old on a trip from Seattle Center to Westlake Center. On the return trip, we waited for 30 minutes for a train without any explanation. My wife finally went to the payment booth and asked what was up. The attendant explained that one of the trains had broken down and it would be 25 minutes before the next arrived. My wife explained to the attendant that she might make an announcement. There was apparently no one else in authority present. The attendant, a non-native speaker, made two very quiet, inaudible announcements. We walked around and spread the news since the Monorail was incapable of doing such. With our kids overtired and having already waited 30 minutes, and my suspicion being that in another 30 minutes, we would be lucky to make it onboard the train -- and my desire to not be trapped in case it was a track problem rather than a train problem -- we walked about six blocks and caught a bus. I didn't wait in the 100-person line for refunds. Nor did the attendant or anyone present have any information about an alternative, such as the nearest bus routes. I would like my $6.00 back for our return trip and $3.75 for having to pay for a bus to get us back to Seattle Center. $9.75 is sort of a ridiculous sum to ask for, but I trusted the Monorail and you all let me down. I'd be happy to send you receipts for the round-trip tickets we used half of. There needs to be someone in charge at Westlake Center when something goes wrong--within 30 minutes, someone could have gotten from Seattle Center, if that's where operations are based, to at least explain to the crowds, numbering about 200 by the time we left. The attendant was *still selling tickets* even as she gave refunds when we left.